Manufactured by W. Pound Ltd, City Rd. London. Stores Ref. 22c/1. 'Belts. life-saving, self-inflating, Type A-Perrin'. 22c/15 'Jacket, life-saving - Anliffe pattern (obs. 1924). Whilst Paul Perrin, a Frenchman invented the lifebelt, Mark Auliff acted as the British Sales agent for this venture. 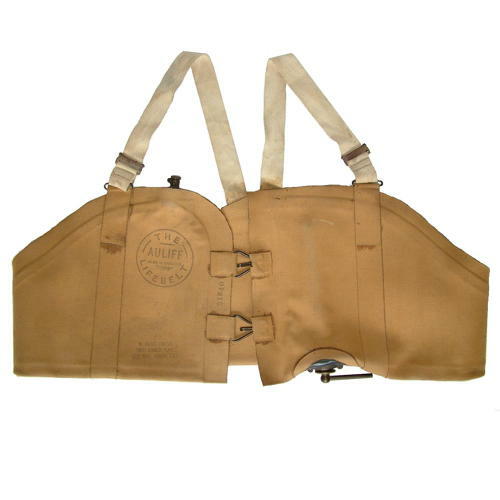 Essentially a lifejacket waistcoat manufactured in airtight/rubberised buff-coloured, thick cotton twill. Fitted with adjustable white cotton webbing shoulder straps. The lifebelt fastened at the front with two metal hooks engaging with triangular shaped metal 'D' rings. A compressed gas cylinder was fitted internally and deployed for use with a metal lever on the outside lower right (see photographs). In addition there was a brass oral inflation valve fitted to the upper left front corner enabling the wearer to inflate or top-up manually. Both the inside and outside faces are printed with instructions for wearing and operating the lifebelt. Whilst lifejackets were not commonly used in WW1, photographic evidence does show their use and the war office did officially introduce them. This rare survivor is well marked but lacks official war department markings suggesting it might be a commercial version. It shows only light use and wear and is in excellent overall condition remaining strong and supple. Complete with original 'live' CO2 gas cylinder, the inflation lever and the top-up nozzles. A superb and rare display piece. Stock code MW16625. NB. The CO2 cylinder cannot be posted overseas and will have to be removed if purchased by an overseas client.